Protecting your firearm from being damaged during travel to and from the range is vital. Having the right carrying case for each firearm is a cheap investment. To be able to carry both handguns to the range at the same time we use a pistol case that is specifically laid out for two pistols. The criteria that we use to evaluate pistol carrying cases are: 1) size, 2) security, 3) method to prevent items from moving, 4) quality of materials and 5) price. Our choice for our two handgun case is an Armadillo Pistol Case. The Armadillo Pistol Case's external measurements are 16" x 3" x 12". The internal measurements are 15 5/8" x 2 3/4" x 11 3/4". Internally the case has 4 straps to secure firearms and 4 pistol magazine pouches. There are no external pockets/pouches and no shoulder strap. Although you can no longer purchase this exact pistol case (since they went out of business) you can buy pistol cases like this at Amazon. To carry our HK MP5 A5 to the range we use a SMG carrying case. The criteria that we use to evaluate small caliber carbine carrying cases are: 1) size, 2) security, 3) method to prevent items from moving, 4) quality of materials and 5) price. The UTG 34" Gun Case's external measurements are 34 1/4" x 4 1/2" x 12 1/4". The internal measurements are 33 3/4" x 4" x 12". Internally the case has 6 straps to secure firearms and 4 large (e.g. 5.56mm) magazine pouches. There is one 29 1/2" x 10" external pocket and a shoulder strap. We like the fact that this carrying case is smaller than a rifle case and has the look of a business case instead of a gun case. You can buy this carrying case at Amazon. To carry our Uzi to the range we use a SMG carrying case. The criteria that we use to evaluate folding stock pistol caliber carbine carrying cases are: 1) size, 2) security, 3) method to prevent items from moving, 4) quality of materials and 5) price. 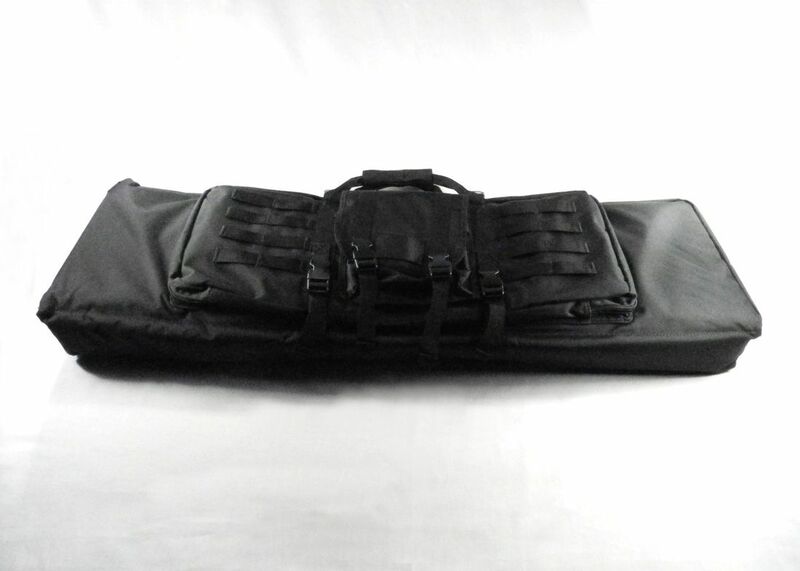 The UTG 25" Gun Case's external measurements are 26" x 4 1/2" x 12". The internal measurements are 25 3/4" x 4" x 11 3/4". Internally the case has 6 straps to secure firearms and 3 large (e.g. 5.56mm) magazine pouches. 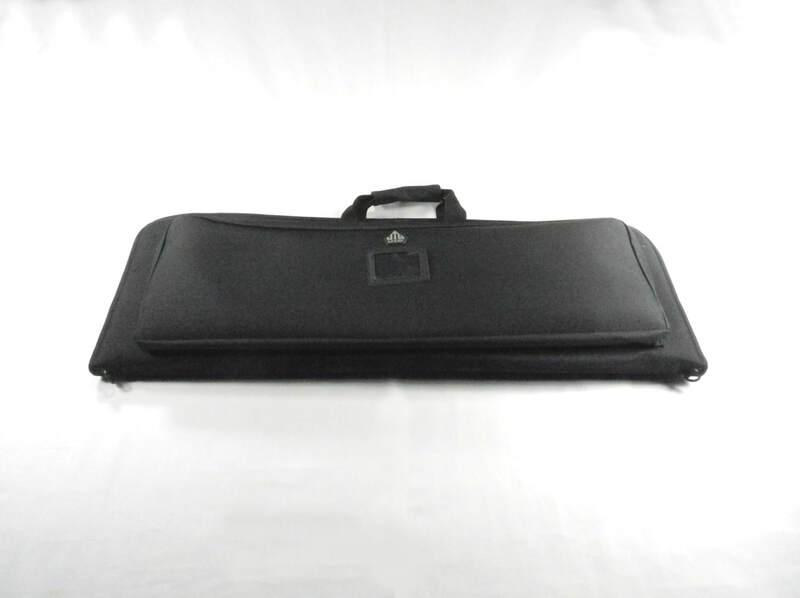 We like the fact that this carrying case is significantly smaller than a rifle case and has the look of a business case instead of a gun case. There is one 22 1/2" x 10" external pocket and a shoulder strap. You can buy this carrying case at Amazon. To carry our 995TS to the range we use a carbine carrying case. The criteria that we use to evaluate short range pistol caliber carrying cases are: 1) size, 2) security, 3) method to prevent items from moving, 4) quality of materials and 5) price. 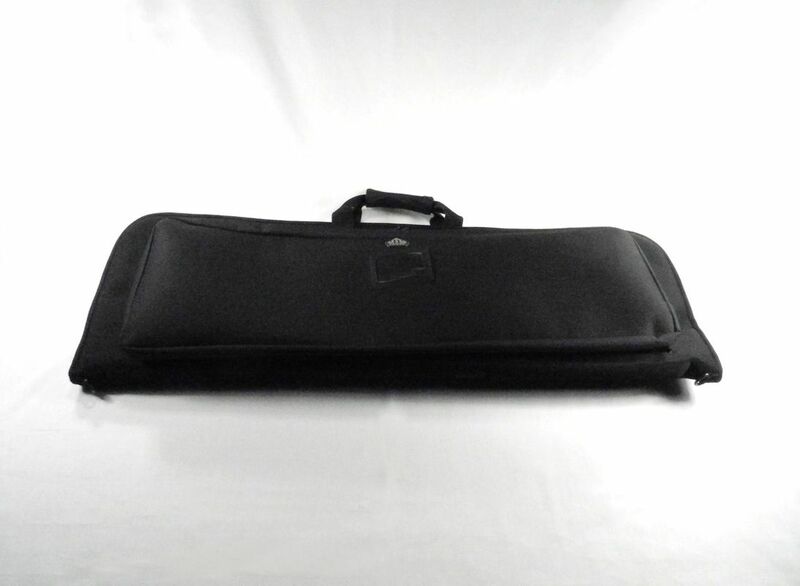 The Morton Enterprises 32" Carbine Case's external measurements are 33" x 5 1/2" x 9". The internal measurements are 31 3/4" x 5" x 8 3/4". Internally the case does not have any straps to secure firearms and or any magazine pouches. There is one 11" x 7" external pocket but no shoulder strap. You can buy this carrying case at uniquecases.com. To carry our CA94 to the range we use a SMG carrying case. The criteria that we use to evaluate pistol caliber carrying cases are: 1) size, 2) security, 3) method to prevent items from moving, 4) quality of materials and 5) price. The UTG 34" Gun Case's external measurements are 34 1/4" x 4 1/2" x 12 1/4". The internal measurements are 33 3/4" x 4" x 12". Internally the case has 6 straps to secure firearms and 4 large (e.g. 5.56mm) magazine pouches. There is one 29 1/2" x 10" external pocket and a shoulder strap. We like the fact that this carrying case is smaller than a rifle case and has the look of a business case instead of a gun case. You can buy this carrying case at Amazon. To carry our CZ Scorpion to the range we use a SMG carrying case. The criteria that we use to evaluate pistol caliber carbine carrying cases are: 1) size, 2) security, 3) method to prevent items from moving, 4) quality of materials and 5) price. The UTG 34" Gun Case's external measurements are 34 1/4" x 4 1/2" x 12 1/4". The internal measurements are 33 3/4" x 4" x 12". Internally the case has 6 straps to secure firearms and 4 large (e.g. 5.56mm) magazine pouches. There is one 29 1/2" x 10" external pocket and a shoulder strap. We like the fact that this carrying case is smaller than a rifle case and has the look of a business case instead of a gun case. You can buy this carrying case at Amazon. To carry our Colt 9mm AR-15 (R6430) to the range we use a SMG carrying case. The criteria that we use to evaluate pistol caliber carbine carrying cases are: 1) size, 2) security, 3) method to prevent items from moving, 4) quality of materials and 5) price. 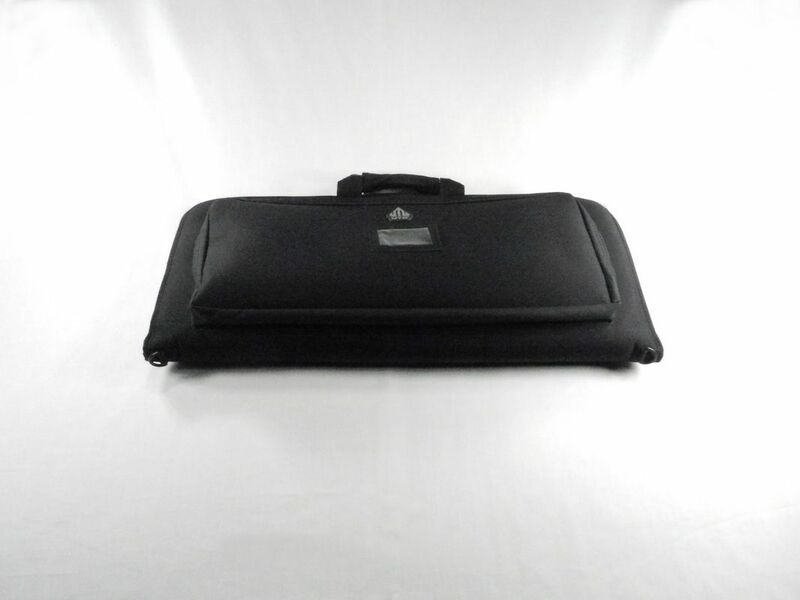 The UTG 34" Gun Case's external measurements are 34 1/4" x 4 1/2" x 12 1/4". The internal measurements are 33 3/4" x 4" x 12". Internally the case has 6 straps to secure firearms and 4 large (e.g. 5.56mm) magazine pouches. There is one 29 1/2" x 10" external pocket and a shoulder strap. We like the fact that this carrying case is smaller than a rifle case and has the look of a business case instead of a gun case. You can buy this carrying case at Amazon. To carry our Winchester 121 and S&W 15-22 to the range we use a double rifle carrying case. The criteria that we use to evaluate two rifle carrying cases are: 1) size, 2) security, 3) method to prevent items from moving, 4) quality of materials and 5) price. 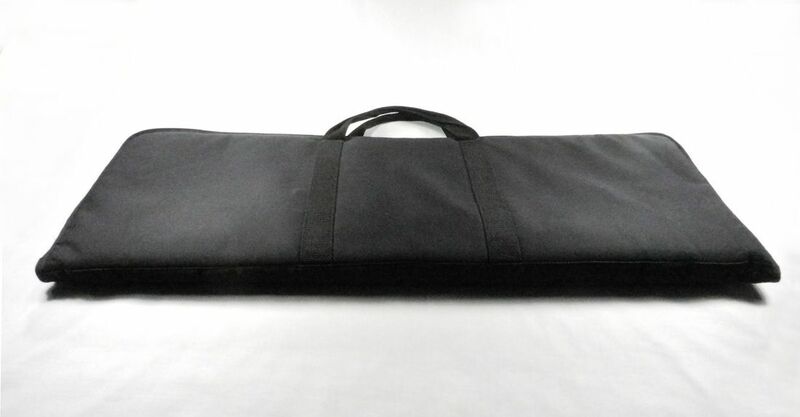 The Condor Double Rifle Case's external measurements are 42" x 9" x 14". The internal measurements are 40 1/4" x 8" x 13". Internally the case has pouches for 2 pistols, 4 straps and 4 end caps to secure firearms, but there are no magazine pouches. There is one 27" x 11 1/2" external pocket, one 8" x 9" external pouch and a set of backpack type shoulder straps that can be tucked away on the back of the case. You can buy this carrying case at Amazon. To carry our Stag Model 9 to the range we use a rifle carrying case. The criteria that we use to evaluate pistol caliber multi-shot rifle carrying cases are: 1) size, 2) security, 3) method to prevent items from moving, 4) quality of materials and 5) price. The Cabela's 42" Tactical Gun Case's external measurements are 41 1/2" x 5 1/2" x 12". The internal measurements are 40" x 5" x 12". Internally the case has 2 straps and 4 end caps to secure firearms but does not have any magazine pouches. There is one 13" x 10" external pocket, one 13" x 7" pocket, 2 pouches and a shoulder strap. Although you cannot buy this case anymore (Cabela’s quit making them for some reason) you can buy cases similar to this at Amazon. 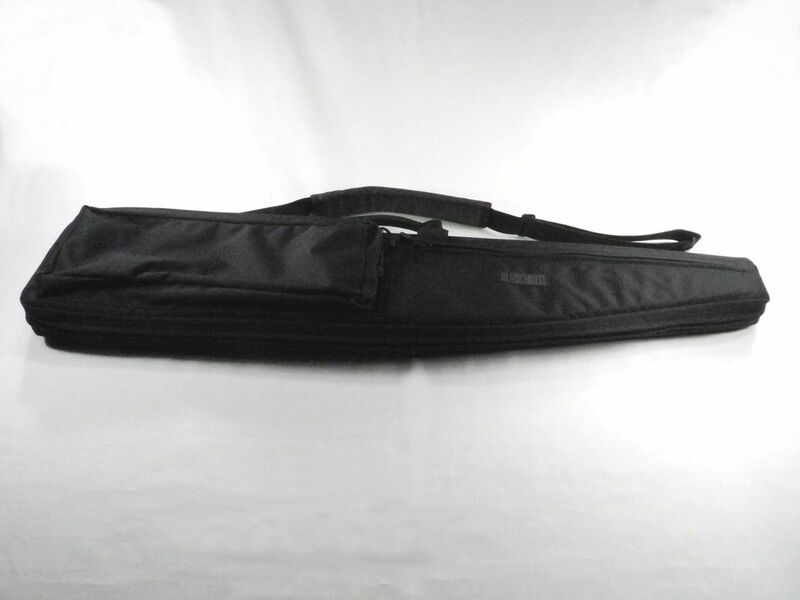 To carry our Stag Model 3 to the range we use a rifle carrying case. The criteria that we use to evaluate large caliber multi-shot rifle carrying cases are: 1) size, 2) security, 3) method to prevent items from moving, 4) quality of materials and 5) price. The Cabela's 42" Tactical Gun Case's external measurements are 41 1/2" x 5 1/2" x 12". The internal measurements are 40" x 5" x 12". Internally the case has 2 straps and 4 end caps to secure firearms but does not have any magazine pouches. There is one 13" x 10" external pocket, one 13" x 7" pocket, 2 pouches and a shoulder strap. Although you cannot buy this case anymore (Cabela’s quit making them for some reason) you can buy cases similar to this at Amazon. To carry our Colt Sporter II AR-15 to the range we use a rifle carrying case. The criteria that we use to evaluate large caliber multi-shot rifle carrying cases are: 1) size, 2) security, 3) method to prevent items from moving, 4) quality of materials and 5) price. 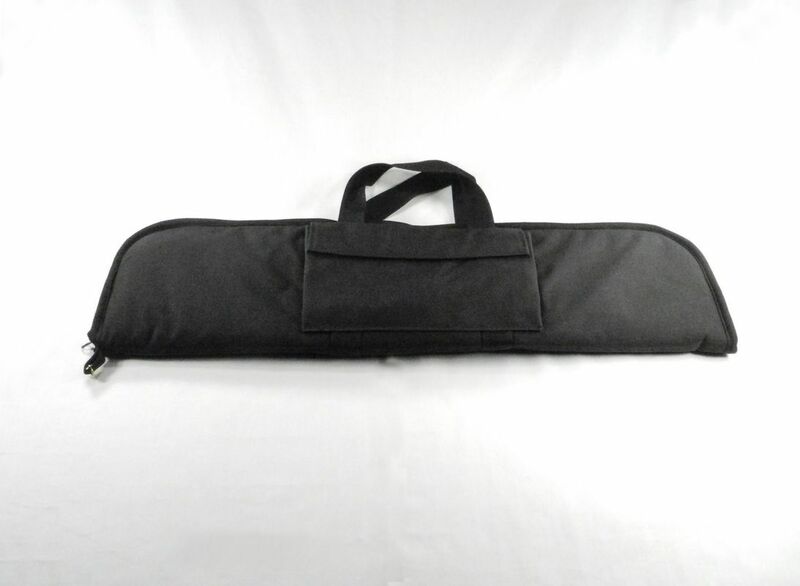 The Plano 81560 Gun Guard soft case is specifically designed to fit AR-15 style firearms and has the following external dimensions: 42.5" x 13.5" x 3.5”. The internal dimensions are: 41" x 12½ " x 2". 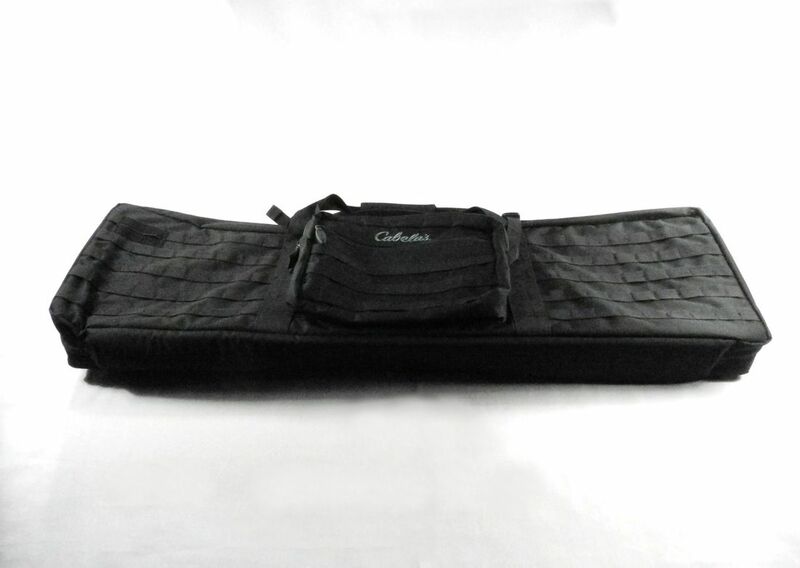 It has a tough 600D nylon fabric shell, quilted high-density foam interior and dimpled PVC material is used to reinforce key stress points on the case. The exterior pocket houses five additional interior pockets designed to hold magazines. Additional features include full length zippers for quick removal and storage of your firearm along with a removable padded shoulder strap and carrying handles. You can buy this AR-15 case at Amazon. To carry our Norinco MAK-90 to the range we use a rifle carrying case. The criteria that we use to evaluate large caliber multi-shot rifle carrying cases are: 1) size, 2) security, 3) method to prevent items from moving, 4) quality of materials and 5) price. Although the Plano 81560 Gun Guard soft case was specifically designed to fit AR-15 style firearms, it is also a perfect fit for the Norinco MAK-90. The case has the following external dimensions: 42.5" x 13.5" x 3.5”. 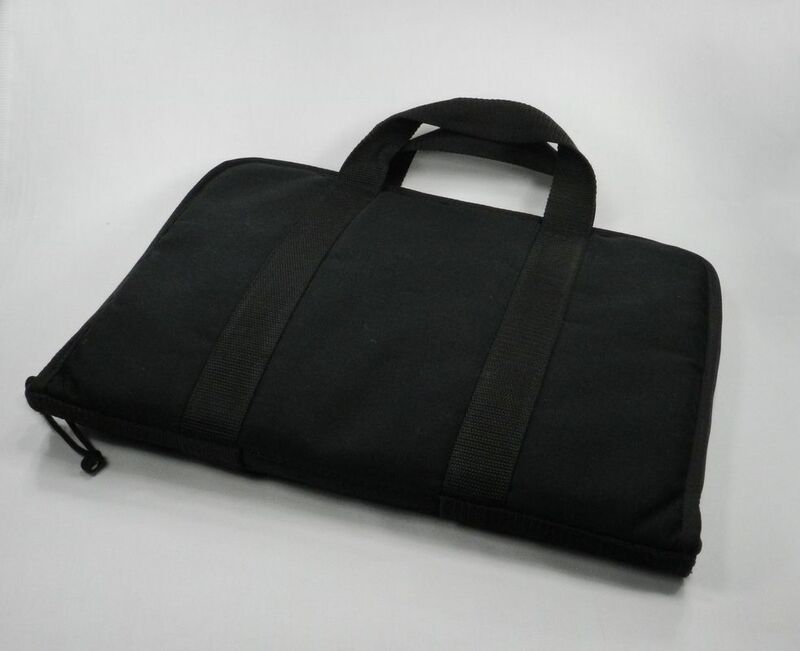 The internal dimensions are: 41" x 12½ " x 2" It has a tough 600D nylon fabric shell, quilted high-density foam interior and dimpled PVC material is used to reinforce key stress points on the case. The exterior pocket houses five additional interior pockets designed to hold magazines. Additional features include full length zippers for quick removal and storage of your firearm along with a removable padded shoulder strap and carrying handles. You can buy this AK-47 case at Amazon. To carry our Henry .410 to the range we use a shotgun carrying case. The criteria that we use to evaluate shotgun carrying cases are: 1) size, 2) security, 3) method to prevent items from moving, 4) quality of materials and 5) price. The Outdoor Connection Max Tactical Case's (model 28109) is made of moisture resistant 600 denier polyester and its external measurements are 41" x 3” x 7 ½” (tapering down to 3”). The internal measurements are 40" x 7 ¼” (tapering down to 2 ¾“). The case has a tear resistant interior lining with 15mm of foam padding, a heavy duty zipper, full wrap carry handles, “D” rings on both ends and comes with a padded removable shoulder strap that has an 8-shell ammo carrier. Internally the case does not have any straps to secure firearms – but is tight enough that it keeps the firearm snugly in place. Externally the case has one 9" x 1" x 6" pocket that has an elastic holder for 6 shells inside it. The case does not unzip all the way so that it lays flat – a nice design feature that we like since it keeps the shotgun from accidently sliding out of the case. We especially like this case since at 41” long it perfectly fits the Henry .410 (20” barrel; model H018-410R) without having lots of excess material flopping around at the top of the case. You can buy this carrying case at Amazon. 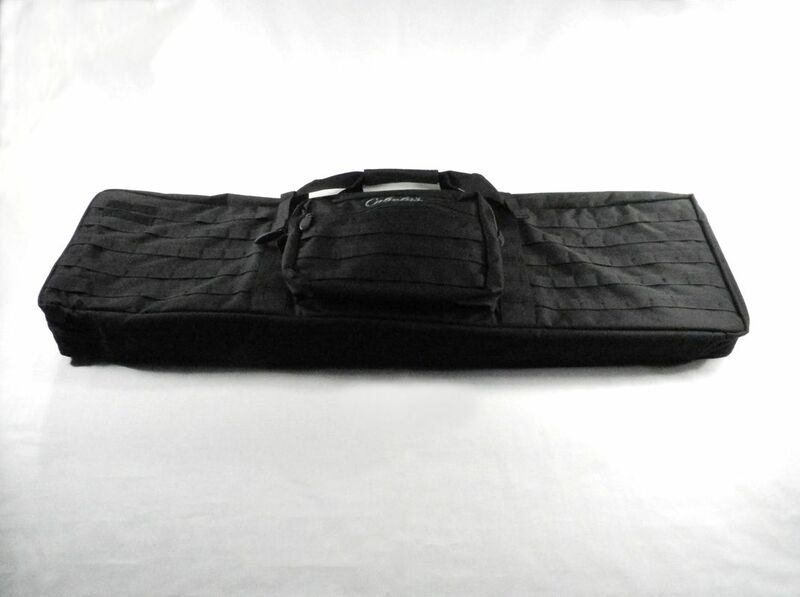 To carry our Benelli SuperNova to the range we use a shotgun carrying case. The criteria that we use to evaluate shotgun carrying cases are: 1) size, 2) security, 3) method to prevent items from moving, 4) quality of materials and 5) price. The Blackhawk! Black Shotgun Case's external measurements are 43" x 5" x 9". The internal measurements are 41 3/4" x 4 3/4" x 8 1/2". Internally the case does not have any straps to secure firearms and or any magazine pouches. There is one 18 1/2" x 7" external pocket, one 19" x 6" to 2" decreasing in height pocket and a shoulder strap. You can buy this carrying case at Amazon. To carry our Franchi Law-12 to the range we use a shotgun carrying case; a second case exactly the same as the case that we use for our Benelli Supernova. The criteria that we use to evaluate shotgun carrying cases are: 1) size, 2) security, 3) method to prevent items from moving, 4) quality of materials and 5) price. The Blackhawk! Black Shotgun Case's external measurements are 43" x 5" x 9". The internal measurements are 41 3/4" x 4 3/4" x 8 1/2". Internally the case does not have any straps to secure firearms and or any magazine pouches. There is one 18 1/2" x 7" external pocket, one 19" x 6" to 2" decreasing in height pocket and a shoulder strap. You can buy this carrying case at Amazon. To carry our Franchi Spas-12 shotgun to the range we use a shotgun carrying case. The criteria that we use to evaluate shotgun carrying cases are: 1) size, 2) security, 3) method to prevent items from moving, 4) quality of materials and 5) price. The Hafner Creations Discreet Case is designed to fit firearms that are tall, like the Spas-12 with its folding handle. The case is rectangular with handles that go around case and double zipper slides so the case opens flat. The case has the following external dimensions: 35" x 12" x 2”. The internal dimensions are: 34½ " x 12" x 1¼ ". You can buy this shotgun case at Hafner Worldwide. To carry our Benelli M2 to the range we use the same shotgun carrying case that we use for our SuperNova and Law-12. The criteria that we use to evaluate shotgun carrying cases are: 1) size, 2) security, 3) method to prevent items from moving, 4) quality of materials and 5) price. The Blackhawk! Black Shotgun Case's external measurements are 43" x 5" x 9". The internal measurements are 41 3/4" x 4 3/4" x 8 1/2". Internally the case does not have any straps to secure firearms and or any magazine pouches. There is one 18 1/2" x 7" external pocket, one 19" x 6" to 2" decreasing in height pocket and a shoulder strap. You can buy this carrying case at Amazon. 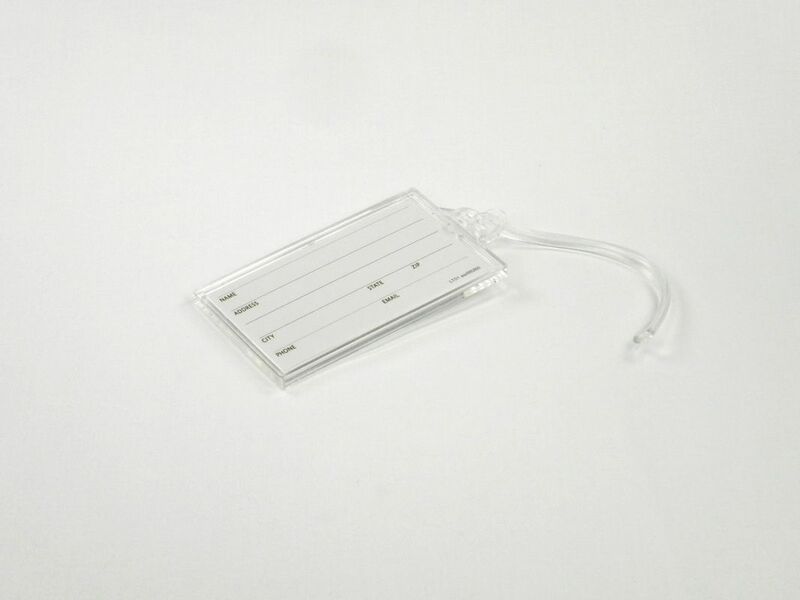 To make sure that our carrying cases are easy to pick out when they are next to all of the other black carrying cases we have added clear plastic luggage tags to them. The criteria that we use to evaluate carrying case luggage tags are: 1) size, 2) transparency on both sides, 3) durability, and 4) price. For this we purchased clear Acrylic Luggage Tags that allow you to open them up, insert a 2” x 3.5” business card and then snap them closed. You can buy these luggage tags at eBay.com.